Volvo Buses and Siemens have signed a global agreement regarding supply of complete electrified bus systems to cities. Under the agreement, Volvo Buses will supply electric-hybrid buses and full-electric buses to customers, and Siemens will supply and install high-power charging stations (charging capacity of up to 300 kW) for the electric vehicles. The two companies have been working together since 2012 within the field of electromobility, and have now strengthened the cooperation further. One objective is to develop a standard for charging infrastructure in order to facilitate for cities to transfer to electrified bus systems. “We are very pleased to partner with one of the world’s largest technology companies, which shares our vision of electromobility. The agreement enables us to seize new business opportunities and support the cities in the shift to sustainable and cost-efficient public transportation systems,” said Håkan Agnevall, President Volvo Bus Corporation. “Electrified buses are an essential part of sustainable urban public transportation. Siemens and Volvo bring in both technology and experience to shape this trend,” said Jochen Eickholt, CEO Siemens Mobility Division. 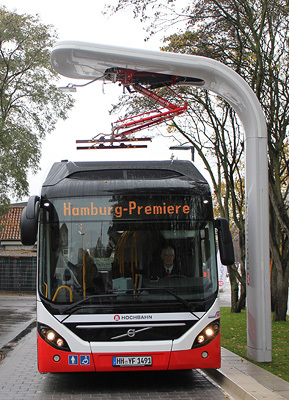 Volvo Buses and Siemens have already delivered a complete city mobility solution consisting of three Volvo electric hybrid buses and four charging stations to the German city of Hamburg, where the buses operate on the city’s new Innovation route. During 2015, full electric buses, electric hybrids and charging infrastructure will be delivered to the Swedish cities of Gothenburg and Stockholm. The charging infrastructure supplied by Siemens includes the charging station, auxiliary equipment, cabling, civil works, installation, commissioning and maintenance. A one-year field test in Gothenburg, Sweden, has shown that the Volvo Electric Hybrid bus enables the reduction of fuel consumption and carbon dioxide by up to 75%, compared with Euro 6 diesel buses. Total energy consumption is reduced by 60%. The Volvo 7900 Electric Hybrid bus runs in electric mode on average 70% of the route, silent and emission-free. Charging at end stations takes up to 6 minutes. Siemens AG (Berlin and Munich) is a global technology powerhouse that has stood for engineering excellence, innovation, quality, reliability and internationality for more than 165 years. The company is active in more than 200 countries, focusing on the areas of electrification, automation and digitalization. One of the world’s largest producers of energy-efficient, resource-saving technologies, Siemens is No. 1 in offshore wind turbine construction, a leading supplier of combined cycle turbines for power generation, a major provider of power transmission solutions and a pioneer in infrastructure solutions as well as automation, drive and software solutions for industry. The company is also a leading provider of medical imaging equipment – such as computed tomography and magnetic resonance imaging systems – and a leader in laboratory diagnostics as well as clinical IT. In fiscal 2014, which ended on September 30, 2014, Siemens generated revenue from continuing operations of €71.9 billion and net income of €5.5 billion. At the end of September 2014, the company had around 357,000 employees worldwide. Further information is available on the Internet at www.siemens.com.